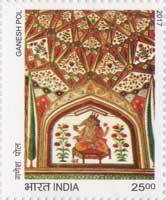 Commemorative Stamp on India Post Payments Bank – 30th January 2017. 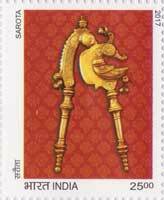 India Post has a wide network of 1,54,939 post offices, of which 1,39,222 post offices are located in rural areas. The Department of Posts was given an in-principle approval to launch a payments bank by the Reserve Bank of India on 19th August, 2015. Payment banks are intended to offer deposit and remittance services to customers but are not allowed to lend directly. They can, however, cross-sell products by third party providers to their customers. Incorporated as a Public-Sector Bank under the Department of Posts with 100% GOI equity, India Post Payment Bank has launched first two branches in Ranchi and Raipur on a pilot basis on 30th January, 2017. Finance Minister, Shri Arun Jaitley and Minister of Communications Shri Manoj Sinha launched the operations of the India Post Payments Bank (IPPB) two pilot branches at Raipur and Ranchi through video conferencing from Delhi. A logo of the new bank was also launched on the occasion. The Union Minister for Finance and Corporate Affairs, Shri Arun Jaitley and the Minister of State for Communications (Independent Charge) and Railways, Shri Manoj Sinha released commemorative stamp on India Post Payments Bank in presence of Shri Mr. B. V. Sudhakar, Secretary, Department of Posts & Chairperson, Postal Services Board and Shri T. Murthy, Director General of Department of Posts at the launch of the India Post Payments Bank branches, through video conferencing from National Media Centre, New Delhi on 30th January, 2017. 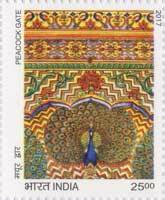 Commemorative Stamps on Nature India – 25th January 2017. 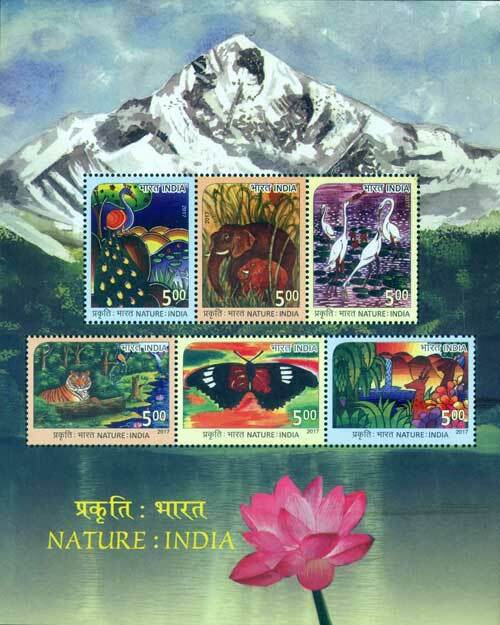 Department of Posts issued a set of six commemorative stamps and a Miniature Sheet on Nature India on 25th January 2017 depicting Peacock, Elephant, Crane, Tiger, Butterfly and Deer. Department of Posts had organised a Stamp Design Competition across the country on the theme 'Nature' for the Republic Day 2017. Ms. Neena Gupta has designed Stamps, Miniature Sheet, First Day Cover and Brochure based on the selected paintings on nature submitted by Mr. Krishna Debnath, Mr. S. Keerthivassan, Mrs. Tripti Dutta, Ms. Pooja, Mr. Souvik Datta, Ms. Souramita Bhaumik, Mr Suyash Goyal, Ms. Debasmita Chakraborty, Mr. Akshat Pamawat, Ms. Mehr Vig, Ms. Yamini K, Mr. Divyansh Sharma, Mr. Aparajita Biswas, Ms. Jetshree Sharma and Ms. V. Aishwaria. Ms. Neena Gupta. Commemorative Stamp on Dr. M. G. Ramachandran – 17th January 2017. Marudur Gopalan Ramachandran (17 January 1917 – 24 December 1987), popularly known as MGR, was an actor and politician who served as Chief Minister of Tamil Nadu for ten years between 1977 and 1987. MGR is a cultural icon in the state of Tamil Nadu, where he is regarded as one of the most influential actors of the Tamil film industry. He made his film debut in the 1936 film Sathi Leelavathi in a supporting role and dominated the Tamil film industry for three decades. 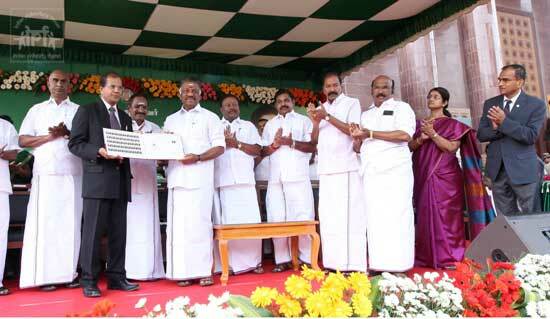 Later he joined Dravida Munnetra Kazhagam (DMK). In 1972, he left the DMK and formed his own party, the All India Anna Dravida Munnetra Kazhagam (AIADMK). He steered an AIADMK-led alliance to victory in the 1977 election, routing the DMK in the process. He became Chief Minister of Tamil Nadu, the first film actor to become a chief minister in India. The birth centenary of Dr. M G Ramachandran was celebrated on 17th January 2017 at the Dr MGR Medical University campus in Guindy. On the occasion a Commemorative Stamp was released by the Tamilnadu Chief Minister O Panneerselvam in presence of Shri T. Murthy, Director General of Department of Posts, Shri Charles Lobo, Chief Postmaster General, Tamilnadu Circle and other cabinet ministers. 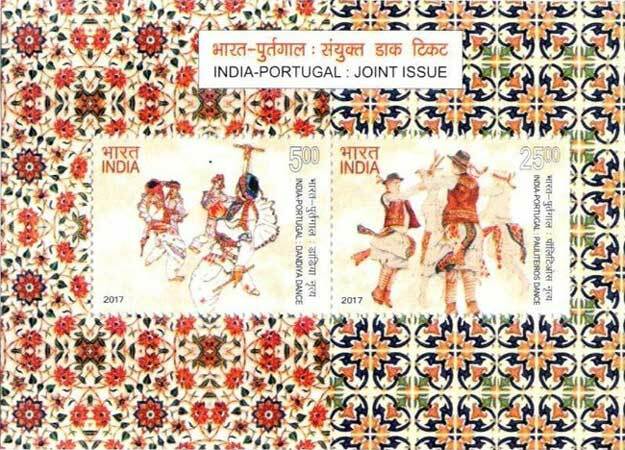 Commemorative Joint Issue Stamps on Diplomatic relations between India and Portugal – 7th January 2017. India attaches great value to its historical bonds with Portugal spanning over 500 years. India and Portugal enjoy excellent bilateral relationship with each other with frequent and active interaction through different platforms that allow both countries to exchange views on many of common issues of concern. This collaboration has been fruitful and beneficial for both countries and the ties of both countries continue to grow from strength to strength over the years. The Prime Minister, Shri Narendra Modi and the Prime Minister of Portuguese Republic, Mr. Antonio Costa released a set of two commemorative Joint Issue stamps (5 Rs and 25 Rs), issued by the postal departments of India and Portugal, at Hyderabad House, New Delhi on 7th January, 2017. 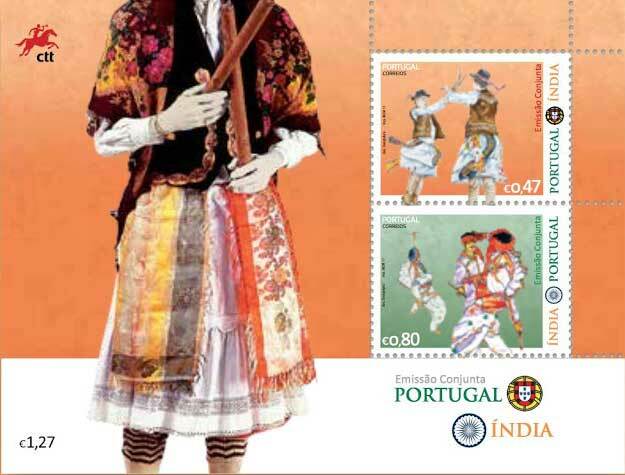 Both the stamps depict Dandiya Dance of India and Pauliteiros Dance of Portugal. A miniature sheet has also been released. Dandiya dance is the most popular traditional folk dance form of Gujarat. 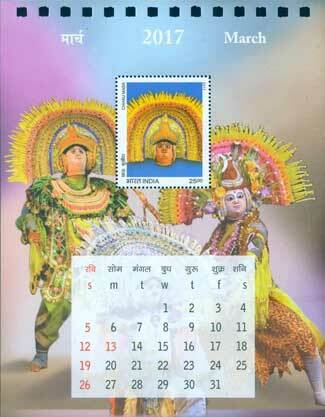 It is a special feature of the Navratri festival. Dandiya is a dance form usually performed in a group, by both men and women. The special feature of the Dandiya dance is the colourful attire worn by the dancers and the colourful sticks carried by them. The wooden sticks are used as prop and are beautifully decorated. 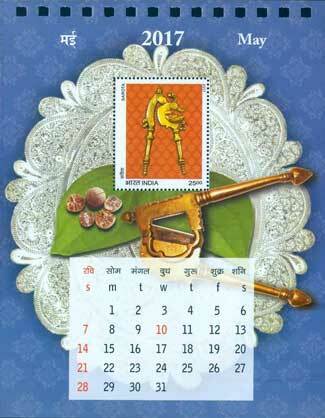 Dandiya dance or Raas is also associated with scenes of Holi, and lila of Krishna and Radha at Vrindavan. The Portuguese stick dance known as dança dos paulitos or Pauliteiros. Male stick dancers from North Eastern Portugal are called “Pauliteiros” – a word that derives from “paulito” (small stick). The stick dance of binary metrum is called dança dos paus, dança dos paulitos, dança dos Pauliteiros and, in Mirandês language, la dança and dança de palotes. The dance is characterized by the use of two sticks that the dancers hit to the rhythm of the music played by the gaiteiros, a musical group composed by gaita-de-foles (bagpipe), caixa (small drum) and bombo (big drum), or by the so called tamborileiro, i. e. the individual that plays tamboril (drum) and fraita (three-holed pastoral flute) at the same time. It is performed by eight men in a specific costume, either comprising white embroidered skirts, woolen socks, decorated vests (coletes) and hats, or black trousers, white shirts, black vests and decorated hats. 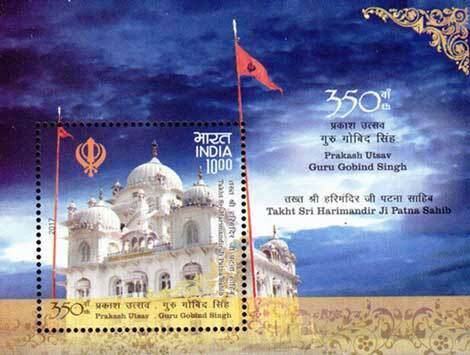 Commemorative Stamp on 350th Prakash Utsav – Guru Gobind Singh – 5th January 2017. 'Prakash Parv' or 'Prakash Utsav' is one of the most widely celebrated occasions of the Sikh community. 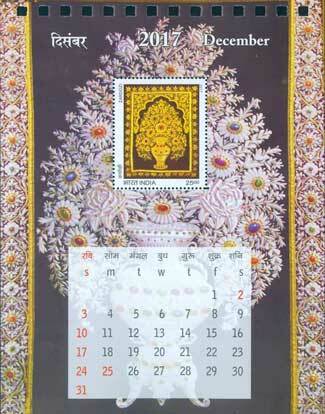 It is calculated according to the Nanakshahi Sikhism calendar and is variably celebrated every year. Guru Gobind Singh, the tenth Sikh Guru, was born on Poh Sudi 7th, 23rd Poh 1723 Bikrami Samvat at Patna. He also spent his early years here before moving to Anandpur. On the site of the house in which Guru Gobind Singh ji was born and where he spent his early childhood now stands the sacred Harimandir Sahib, one of the five most honourd seats of religious authority for the Sikhs. The year 2017 commemorates the 350th birth anniversary of the 10th Sikh Guru, Shri Guru Gobind Singh Ji, the creator of the gracious “Khalsa”. The event was celebrated with grandeur befitting the occasion at Patna from 30th December, 2016 to 8th January, 2017. 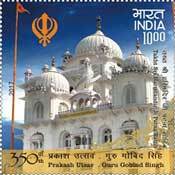 To commemorate 350th Prakash Utsav, Department of Posts issued a Commemorative stamp and Miniature Sheet in denomination of Rs.10 depicting Takht Sri Harimandir Ji Patna Sahib. 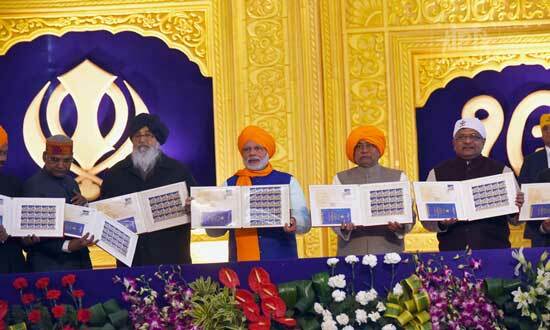 The Prime Minister, Shri Narendra Modi released the stamp at the function held at Patna to mark 350th birth anniversary celebrations of Shri Guru Gobind Singh Ji in presence of The Governor of Bihar, Shri Ram Nath Kovind, the Union Minister for Electronics & Information Technology and Law & Justice, Shri Ravi Shankar Prasad, the Chief Minister of Bihar, Shri Nitish Kumar and the Chief Minister of Punjab, Shri Parkash Singh Badal on 5th January 2017. 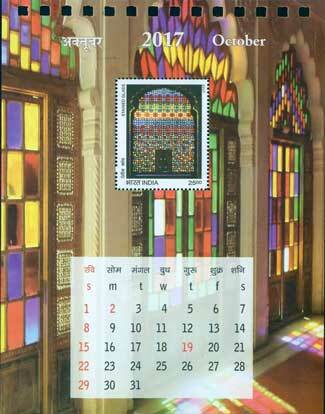 Commemorative Stamps on Spelndours of India – Happy New Year – 1st January 2017. 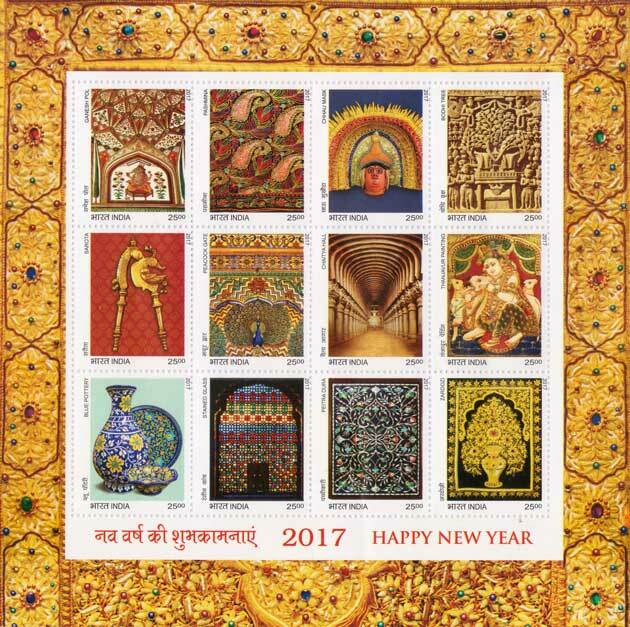 Department of Posts released a set of twelve commemorative stamps in form of Miniature Sheet in denomination of Rs 25 each on the theme Splendours of India on 1st January 2017. 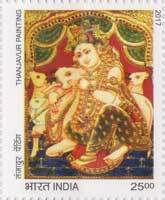 The stamps feature Ganesh Pol/Ganesh Gate (Amber Fort, Jaipur), Pashmina Shawl (Kashmir), Chhau Dance Mask (Eastern India), Bodhi Tree, Sandstone Relief Sculpture (Sanchi), Sarota (Areca Nut Cutter), Peacock Gate (City Palace, Jaipur), Chaitya Hall (Karle Caves, Near Lonavala), Thanjavur (Tanjore) Painting, Blue Pottery (Jaipur), Coloured Glass Window (Bagore Ki Haveli, Udaipur), Parchinkari (Pietra Dura), and Zardozi Carpet (Agra). 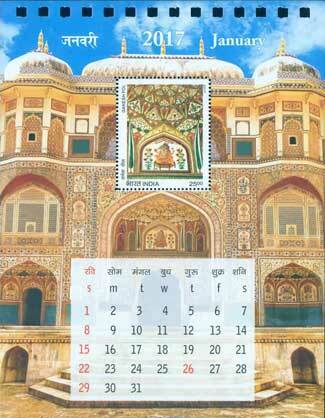 The miniature sheet is printed by Security Printing Press, Hyderabad. 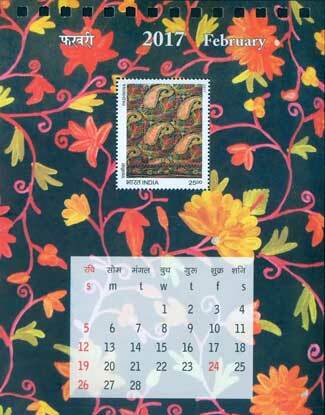 Size of stamps in the miniature sheet is 33 mm x 40 mm. Ganesh Pol, or the Ganesh Gate, is in the south side of the courtyard of the palace in the Amber Fort, Jaipur. It was built in the honor of Mughal Emperors under whom the Maharajas of Jaipur served in their army. It is named after the Hindu God Lord Ganesh, who removes all obstacles in life and it is the entry into the private palaces of the Maharajas. It is built in the architectural style of kingdom and Lord Ganesha (elephant God) is in the middle of the long arch. 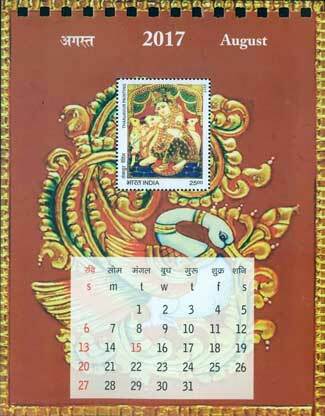 And the interesting fact is that Lord Ganesha is not put in the traditional style but in the profile. It is a three-level structure with many frescoes that was also built at the orders of the Mirza Raja Jai Singh (1621–1627). 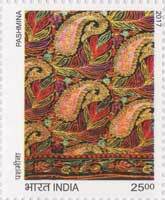 Pashmina is a fine type of cashmere wool. The textiles made from it were first woven in Kashmir. The name comes from Persian, meaning "made from wool" and literally translates to "Soft Gold" in Kashmiri. The wool comes from four distinct breeds of the Cashmere goat; namely the Changthangi or Kashmir Pashmina goat from the Changthang plateau in Kashmir region, the Malra from Kargil area in Kashmir region, the Chegu from Himachal Pradesh in northern India. Pashmina shawls are hand spun, and woven in Kashmir and made from fine cashmere fibre. 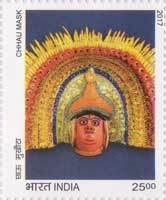 Chhau dance also spelled as Chau or Chhau, is a semi classical Indian dance with martial, tribal and folk origins of the eastern Indian states of Odisha, Jharkhand and West Bengal. It is found in three styles named after the location where they are performed, i.e. the Mayurbhanj Chau of Odisha, the Purulia Chau of Bengal and the Seraikella Chau of Seraikela & Kharsawan District (Historically Odia Princely States of Jharkhand. 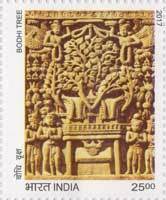 Bodhi Tree, a sandstone relief sculpture is from the Sanchi Stupa Complex of Madhya Pradesh. It is an elaborately carved sandstone relief sculpture in the Sanchi Stupa Complex. The “Bodhi Tree” or the “Tree of Enlightenment” is so called because it represents the “Ficus Tree” (or the “Peepul Tree”) under which Buddha attained enlightenment. The Bodhi Tree motif is used as a symbol of Buddha himself. “Sarota” (or scissor like cutter, made of metal) is the instrument, traditionally used to cut the “Areca nut” (also known as “betel nut”) into small pieces to be chewed along with other ingredients, wrapped in betel leaves. “Sarota” is found in many shapes and sizes and ornate designs in different parts of the country. Peacock gate is one of the most famous of the four gates at the inner courtyard which provides access to Chandra Mahal in City Palace, Jaipur. This is one of the four gates It is ornamented with motifs of peacock and represents the autumn season. This gate is dedicated to Lord Vishnu. This gate is located on the North-East side of the courtyard. This gate is last in the series of the four gates of Ridhi Sidhi Pol. 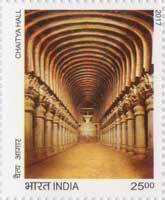 The Karla Caves or Karle Caves or Karla Cells are a complex of ancient Indian Buddhist rock-cut cave shrines located in Karli near Lonavala, Maharashtra. The caves are believed to be some of thousands of similar caves excavated in the Sahyadri Hills in the early 1st millennium AD.The main cave features a large, intricately carved chaitya hall, or prayer hall, dating back to the 1st century BC. This is among the largest rock-cut chaityas in India, measuring 45 metres long and up to 14 metres high. The hall features sculptures of both males and females, as well as animals such as lions and elephants. Thanjavur painting is a classical South Indian painting style, which was inaugurated from the town of Thanjavur (anglicized as Tanjore) and spread across the adjoining and geographically contiguous Tamil country. Thanjavur paintings are characterised by rich, flat and vivid colors, simple iconic composition, glittering gold foils overlaid on delicate but extensive gesso work and inlay of glass beads and pieces or very rarely precious and semi-precious gems. Essentially serving as devotional icons, the subjects of most paintings are Hindu gods, goddesses, and saints. 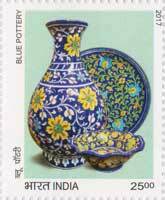 Blue Pottery is widely recognized as a traditional craft of Jaipur, though it is Turko-Persian in origin. The name 'blue pottery' comes from the eye-catching blue dye used to color the pottery. Jaipur blue pottery, made out of a similar frit material to Egyptian faience, is glazed and low-fired. No clay is used: the 'dough' for the pottery is prepared by mixing quartz stone powder, powdered glass, Multani Mitti (Fuller's Earth), borax, gum and water. Another source cites Katira Gond powder (a gum), and saaji (soda bicarbonate) as ingredients. 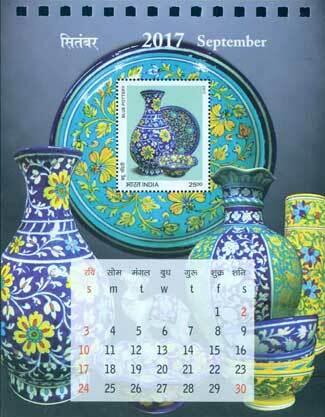 Today, blue pottery is an industry that provides livelihood to many people in Jaipur. Bagore-ki-Haveli is a haveli in Udaipur in Rajasthan state. Amir Chand Badwa, the Prime Minister of Mewar, built it in the eighteenth century. This historic edifice houses around hundred rooms. Each having intricate architectural beauty. 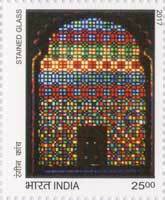 The main attractions are the glass work and glass paintings of the windows and in the interior of the Haveli. The splendid architecture of the mansion has exquisite stained glass work of the 18th Century. 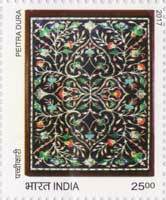 Pietra dura or pietre dure called parchin kari or parchinkari in South Asia, is a term for the inlay technique of using cut and fitted, highly polished colored stones to create images. It is considered a decorative art. The art of Parchinkari had begun in India in the early 17th century with Shah Jahan being its patron and pioneer. This art is derived from an Italian art form known as pietra dura (hard stones) which originated in Florence in the 16th century. It involves shaping small pieces of semi-precious stones in the form leaves, flower petals etc. and fitting them together so that they look like one complete flower or animal or any other shape the artist intended it to look like. The word zardosi is derived from zari ie gold thread. It is an elaborate art of multi -dimensional embroidery using gold and silver threads and embellished with precious stones. Zardosi had its origins in Persia and was introduced into India by the great Mughals in the early 16th century. It was used mainly to adorn the ceremonial robes of the royal families that were studded with emeralds and rubies and embroidered with thread of gold and silver. This form of embroidery was also used to embellish heavy coats, cushion covers, curtains, animal trappings, and canopies. Agra is known for its wondrous tapestries using the traditional form of zardosi to create “needle paintings”. 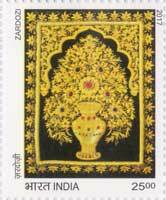 The transformational zardosi craft was pioneered by the renowned Sheikh Shamsuddin who lived in Panni Gali of Phulatti Bazar in the old city of Agra. 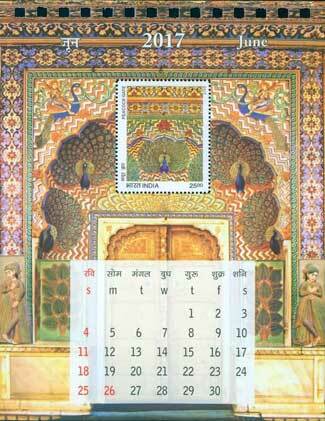 India Posts also issued a desk calendar containing 12 sheets incorporating these twelve stamps on each page. 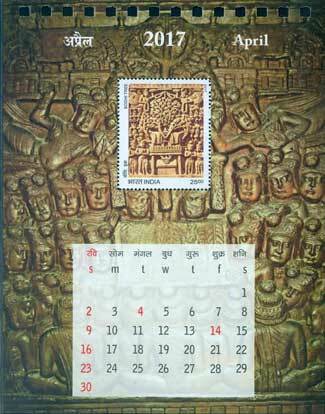 Individual page of the calendar is in form of Miniature Sheet but the stamps in the calendar miniature sheets are bigger than the stamps of miniature sheet. (37 mm x 45 mm). Quality of paper is also different and colours are also different. 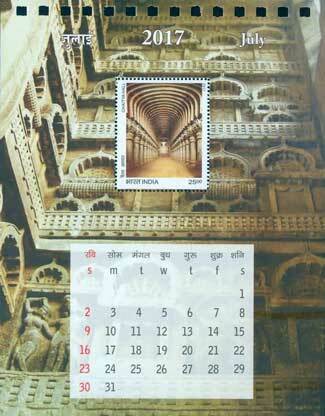 Calendar is printed by India Security Press, Nashik. 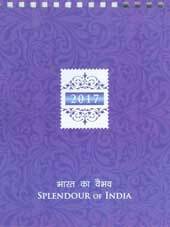 This 2017 Splendour of India Calendar is sold at Philatelic Bureaux and ePost Office portal at Rs. 1000. 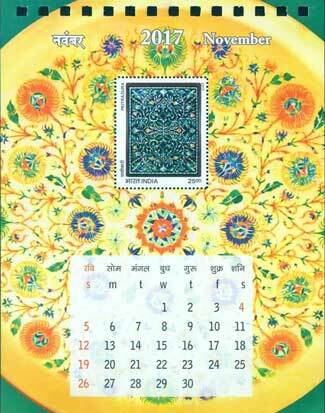 India Post has also launched 2017 desk calendar with out stamps which is sold at Rs. 300.